Castello dei Rampolla has been one of Tuscany’s leading estates for more than four decades. This once-in-a-lifetime tasting encompassed every vintage of Sammarco back to 1981 and provided a rare opportunity to trace the arc of one of Tuscany’s most groundbreaking reds. The only vintage that was not present was the 1980, the last bottles having being laid to rest with Alceo di Napoli. Sammarco was not bottled in 1992, 2001 and 2002. I tasted all of these wines during a visit to the estate in July 2015. The di Napoli family has owned Rampolla since 1739. Alceo di Napoli inherited the estate in 1965. At the time, Rampolla was essentially a summer residence. Wheat, olive trees and other mixed crops were cultivated, but there were no vineyards. “Alceo di Napoli was a man of extraordinary humility,” Piero Antinori told me recently. “He loved the land. After seeing the potential of the vineyards, we helped him get started and bought some of the first grapes off the property. 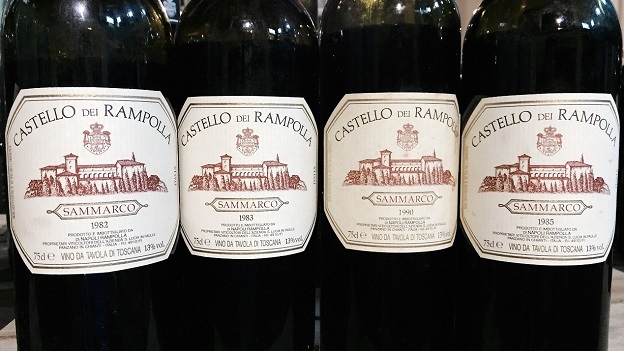 We were very close in the early days.” In 1975, Rampolla began making and bottling their own wines under the guidance of legendary oenologist Giacomo Tachis, whose influence is still widely felt. Tragically, Alceo di Napoli passed away unexpectedly in 1991. Di Napoli’s second son, Luca, returned to the estate in 1994 and today manages the property alongside his sister, Maurizia. Castello dei Rampolla is located in Panzano’s famous Conca d’Oro or ‘golden basin” district, an amphitheater of striking, pristine hillside vineyards. Rampolla’s neighbors include Fontodi, Cafaggio, La Massa, L’Orcio, Le Cinciole and Gagliole’s Valletta estate. The map below, prepared exclusively for Vinous by renowned cartographer Alessandro Masnaghetti, provides an overview of the area. 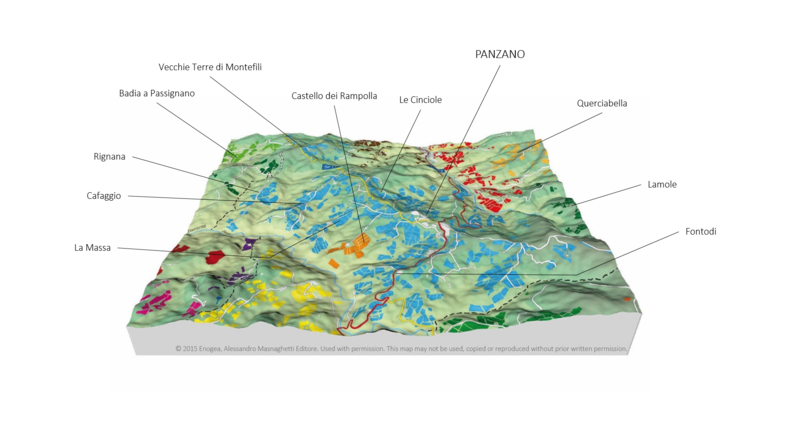 The vineyards of Panzano, technically a sub-zone of Greve, are all shown in blue. Rampolla’s vineyards are highlighted in orange. The three strips at the northwest corner of the property are the three d’Alceo terraces. Note that Rampolla directly faces Fontodi across the valley. 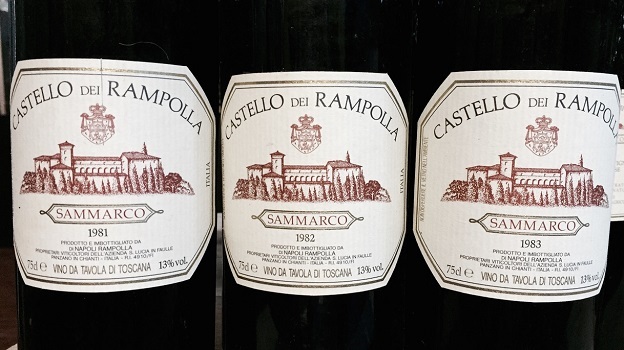 In 1980, Rampolla produced their first vintage of Sammarco, a blend of Cabernet Sauvignon and Sangiovese. It was the early days of Italy’s infatuation with international grapes that would in turn bring a handful of wines a level of recognition and accompanying prestige that was unthinkable back then. Antinori’s first vintage of Tignanello was 1971. Solaia followed in 1978. Tenuta dell’Ornellaia did not exist yet and Sassicaia was still under the radar. It was the very beginning of an entire movement. The first Sammarcos were 60% Cabernet Sauvignon and 40% Sangiovese. Merlot was added in 2003, gradually replacing Sangiovese and giving the wine softer, more modern contours as well as greater early approachability. The Cabernet has always been aged in French oak barrels, with an increasing move towards larger 500-liter formats, while the Sangiovese sees only cask. In this tasting, there is a clear dividing line at 1994, when the wines acquire more density, power and pedigree. It’s not just a matter of the age of the wines or vineyards. It is clearly something more than that. Luca di Napoli credits a move to biodynamic farming that year with the improvement in quality, but that, too, seems, implausible, since even the best vineyards need time to adjust to new farming regimes. Still, it is undeniable that, while Alceo di Napoli made a number of fabulous Sammarcos in the pre-1994 era, the wines simply explode in quality after that. "The first thing I did when I returned to the estate was to leave more cover crop, which encourages a healthy ecosystem and also forces the vines to go deep for nutrients in response to the competition the roots face closer to the surface from the cover crops," Luca di Napoli explains. "I also eliminated the use of chemicals and fertilizers. Aside from the obvious, a more sustainable approach to farming forces the vines to naturally self-regulate production, which in turn results in lower yields and keeps the soils alive. Our Vigna d'Alceo was farmed sustainably from the very beginning, while it took a bit longer to get the rest of the property in shape." While Alceo di Napoli may not have lived to see the heights Rampolla has reached, he would surely be proud to see what his children have done in building on the rich legacy he left behind. The Rampolla wines are world class, something that comes through loud and clear in this unforgettable tasting.